Serverless, the new buzzword in town has been gaining a lot of attention from the pros and the rookies in the tech industry. Partly due to the manner in which cloud vendors like AWS have hyped the architecture, from conferences to meetups to blog posts to almost everywhere. But serverless is not just about the hype, it promises the possibility of ideal business implementations which sounds quite pleasant to the ears and probably light on the budget as well. Sounds relieving though, knowing a lot of your daylight hours go into implementing, maintaining, debugging, and monitoring the infrastructure. With all of that infrastructure heavy lifting out of the way, we really can focus on the business goals our applications serve. A lot of productive efforts could be channeled in the right direction, where they were meant to be ideally. Maybe it sounds too good to be true, but this is the way things should have been. At least for those of you who cant afford to spend a lot of time caught up in the web of intricacies in modern complex infrastructure. Expectations apart, Serverless is really breaking ground in its path to disrupt your server infrastructure. Serverless is already used in production by companies like Netflix, Reuters, AOL, and Telenor. Industry-wide adoption is constantly increasing. Serverless is all set to take up its own place, but don’t expect Serverless to conquer your infrastructure completely. There will be use cases where serverless might prove to be the wrong choice. "Reinventing the wheel isn’t always a good idea." With stateless functions multiple containers can be initialized, allowing as many functions to be run (in parallel, if necessary) as needed to continually service all incoming requests. 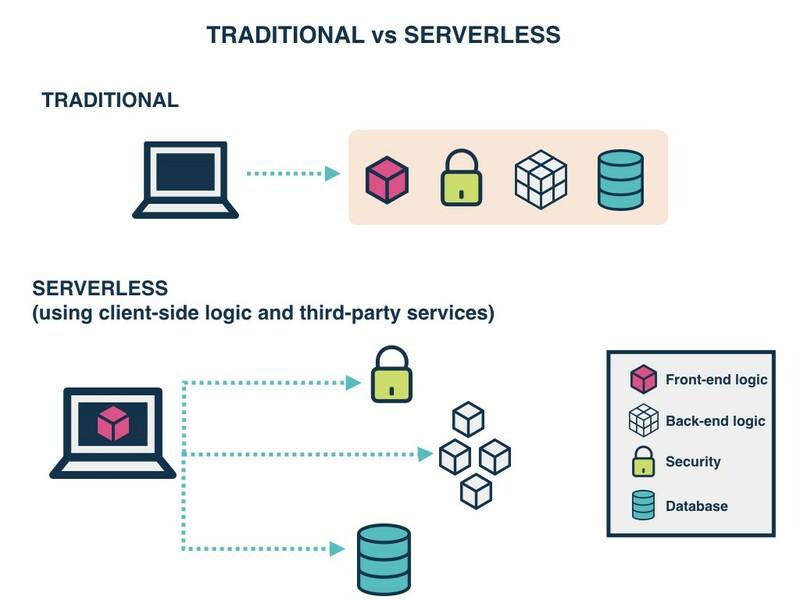 A Serverless solution consists of a web server, Lambda functions (FaaS), security token service (STS), user authentication and database. Web Server — Amazon S3 provides a robust and simple web server. All of the static HTML, CSS and JS files for our application can be served from S3. 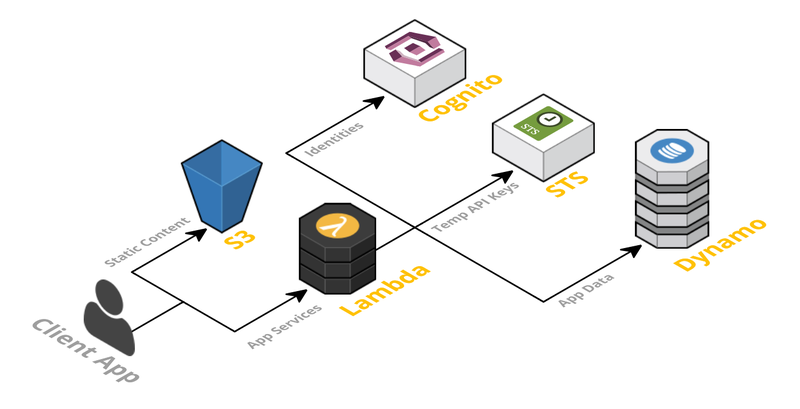 Lambda functions (FaaS) — They are the key enablers in Serverless architecture. 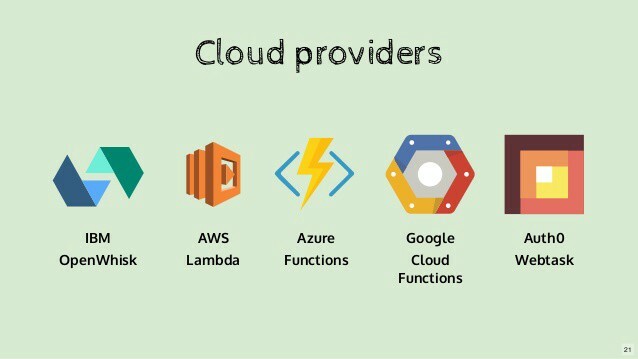 Some popular examples of FaaS are AWS Lambda, Google Cloud Functions and Microsoft Azure Functions. AWS Lambda is used in this framework. The application services for logging in and accessing data will be built as Lambda functions. These functions will read and write from your database and provide JSON responses. Security Token Service (STS) — generates temporary AWS credentials (API key and secret key) for users of the application. These temporary credentials are used by the client application to invoke the AWS API (and thus invoke Lambda). User Authentication — AWS Cognito is an identity service which is integrated with AWS Lambda. With Amazon Cognito, you can easily add user sign-up and sign-in to your mobile and web apps. It also has the options to authenticate users through social identity providers such as Facebook, Twitter or Amazon, with SAML identity solutions, or using your own identity system. Database — AWS DynamoDB provides a fully managed NoSQL database. DynamoDB is not essential for a serverless application but is used as an example here. The cost incurred by a serverless application is based on the number of function executions, measured in milliseconds instead of hours. Process agility: Smaller deployable units result in faster delivery of features to the market, increasing the ability to adapt to change. Cost of hiring backend infrastructure engineers goes down. Reduced liability, no backend infrastructure to be responsible for. Fosters adoption of Nanoservices, Microservices, SOA Principles. Scalable, no need to worry about the number of concurrent requests. Monitoring out of the box. If businesses are using that competitive edge to ship features faster, then customers are receiving new features quicker than before. It is possible that users can more easily provide their own storage backend(i.e Dropbox, Google Drive). It’s more likely that these kinds of apps may offer client-side caching, which provides a better offline experience. Vendor lock-in requires more trust for a third-party provider. Additional exposure to risk requires more trust for a third party provider. Immature technology results in component fragmentation, unclear best-practices. The discipline required against function sprawl. Multi-tenancy means it’s technically possible that neighbour functions could hog the system resources behind the scenes. Significant restrictions on the local state. Unless architected correctly, an app could provide a poor user experience as a result of increased request latency. Serverless platforms need infrastructures where they can be executed, provider agnostic frameworks provide a platform agnostic way to define and deploy Serverless code on various cloud platforms or commercial services. Serverless architecture is certainly very exciting, but it comes with a bunch of limitations. As the validity and success of architectures depend on the business requirements and by no means solely on technology. In the same way, Serverless can shine when used in proper place. Take a look at the awesomeness that is Serverless, its time to take a peek at what Serverless looks from the inside. Here are few links to get you started on your Serverless journey. I hope this article helped in the understanding of Serverless Computing. I’d love to hear about how you use Serverless in your projects. Clap if it increased your knowledge, help it reach more people. A special thanks to Faizan Bashir for allowing us to republish his blog. Stay at https://twitter.com/faizanbasher and read his latest at https://medium.com/@faizanbashir.